Receiver Alshon Jeffery had a rough say with penalties. 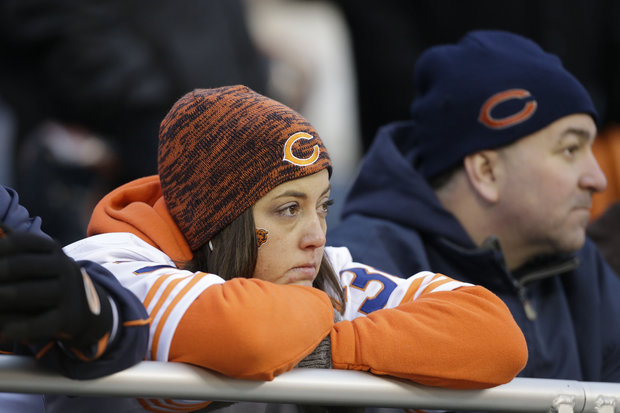 Bears fans feel the pain of another season slipping away. If you heard a big hissing sound from Soldier Field this weekend it was the air going out of the Bears playoff hopes. The 21-13 loss to Green Bay handed the Packers the NFC North division and dropped the Bears to 8-6, diminishing their chances to play in January. The Pack improved to 10-4 and felt good about hurting the Bears&apos; post-season opportunity. Here&apos;s a recap of what went so wrong for Chicago. The tale of the tape of the opposing quarterbacks clearly goes to the Packers&apos; Aaron Rodgers, after a slow start with -3 passing yards in the first quarter. The Green Bay QB took advantage of Bears mistakes and connected with wide receiver James Jones three times. Bears signal-caller Jay Cutler was able to get the Bears on the scoreboard first with a 15-yard pass reception to Brandon Marshall. The Bears had the ball late in the second quarter and the game was tied at 7. Jay Cutler and Devin Hester had a miscommunication and Green Bay’s Casey Hayward grabbed the interception and Rodgers capitalized with touchdown drive in the final seconds of the half. It gave the Packers a 14-7 lead; you could feel the gloom in Soldier Field. Rodgers threw for nearly 300 yards and had the three touchdowns; Cutler threw for just 135 yards going 12 of 21, and had a touchdown and an interception. If there is someone seeing yellow for a while, it would be rookie wide receiver Alshon Jeffery. He was hit with not one, not two, but three offensive pass interference penalties. The young Bear said he has always liked to play physical, asking, “That’s the way the game is supposed to be played, right?” Jeffery wants to look at the film to analyze what really happened on those costly penalties. Garza was clearly miffed and thought the calls should have gone both ways. The Bears were unable to complete a 3rd down play. Zero-nada-none. They finished 0 for 9 on the day. That is a haunting statistic that punctuates how futile this Bears offense is right now. All-Pro Running back Matt Forte was instrumental running in the first quarter but was then ineffective. Conversely, the Packers converted on a number of 3rd down plays and both their 4th down plays. Rodgers feasted on the Bears&apos; defense when he needed a big play. Six weeks ago it seemed Lovie Smith was going to lead this team to playoffs and everything was going rather well (minus the offensive line issues). Now they have to wonder what hit them. They had a plethora of injuries, just like last season. The offense has struggled, just like last year. They now must win and hope other teams lose, just like a year ago. The problem is this season may mirror last season where is matters most: on the sidelines watching the playoffs instead of playing. Just like last year. Correction: An earlier version of this story incorrectly stated the position of Green Bay wide receiver James Jones.